360° point-of-sale payment processing system. Meets all collection management needs and increases cash control. 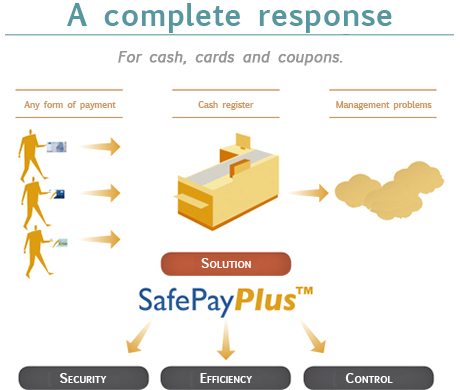 SafePay Plus, which combines Gunnebo’s systems with Saima Systems‘ technology, delivers a single solution that covers every possible payment method (cash, debit and credit cards and discounts or coupons). Updates account balances in real time. Monitors every transaction from start to finish via the PayControlPlus platform. Payment collection and management process inefficiencies are a real problem for retailers because of the costs that administration and manual counts generate and the inefficient use they make of human resources and time. Cuts collection times by 80%. Cuts cashing up by 85% thanks to automated accounts closing. Single terminal for bank and loyalty cards. SafePay Plus is an innovative, flexible payment platform designed to accept any payment method both now and in the future. Self-service and double- and single-entry bookkeeping are all available and combinable. Unexplained losses and cash discrepancies. Unauthorised loyalty card and coupon payments. Eradicate errors due data communication losses. Loyalty coupon checks and confirmation. To provide a real overview of every transaction, closed-circuit TV records every operation and associates each one with a specific payment so that users can visually check who handled the transaction and verify the details. Monitoring every payment collected at points of sale requires enormous tracking capacity. Lack of traceability, information about and control of the money collected lowers its value. Sales by credit institution and bank card type. Smart failsafe system that guarantees effective transactions. Centralises control of all your branches: PayControl Plus. Records every person who comes into contact with the system: CCTV. 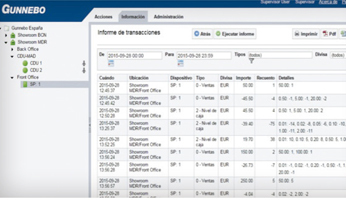 All the transaction information you need via PayControl Plus’s single interface. Centralised control of multiple terminals or points of sale. Accurate and up-to-date cash balances. Cash trend analysis to support optimisation. All the information associated with cash payments and bank and loyalty card transactions on a single platform.